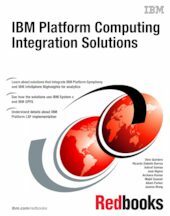 This IBM® Redbooks® publication describes the integration of IBM Platform Symphony® with IBM BigInsights™. It includes IBM Platform LSF® implementation scenarios that use IBM System x® technologies. This IBM Redbooks publication is written for consultants, technical support staff, IT architects, and IT specialists who are responsible for providing solutions and support for IBM Platform Computing solutions. This book explains how the IBM Platform Computing solutions and the IBM System x platform can help to solve customer challenges and to maximize systems throughput, capacity, and management. It examines the tools, utilities, documentation, and other resources that are available to help technical teams provide solutions and support for IBM Platform Computing solutions in a System x environment. In addition, this book includes a well-defined and documented deployment model within a System x environment. It provides a planned foundation for provisioning and building large scale parallel high-performance computing (HPC) applications, cluster management, analytics workloads, and grid applications.